Overall size: 30 1/4" x 24 1/4"
Image size: 23 1/2" x 16 1/2"
Never had there been an aircraft like the de Havilland Mosquito; constructed almost entirely of wood with two Merlin engines bolted under each wing it could outrun any other piston-engine fighter in the world. Only when the Luftwaffe�s Me262 jet came on the scene did the enemy have anything of such speed but, unlike the Me262, the Mosquito � nicknamed the �Wooden Wonder� � was perhaps the most versatile aircraft of World War II. Allied squadrons operated Mosquitos in a huge number of roles including both day and night-bombers, night-fighter, as a ship-buster with Coastal Command, bomber support, photo-reconnaissance and, thanks to its speed and maneuverability as one of the finest intruders of the war. Mosquitos carried out some of the most dangerous and daring low-level pinpoint precision strikes ever seen and, of course, as part of the RAF�s elite Pathfinder force. Formed in 1942 and led by the inspirational Don Bennett, perhaps the finest navigator in aviation history who became the youngest Air Vice-Marshal in the RAF, the Pathfinders were Bomber Command�s specialist target-marking squadrons who, flying ahead of the main bomber force, located and identified their assigned targets with flares. 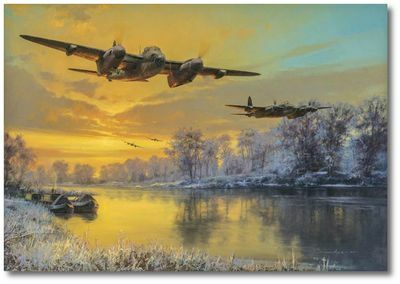 Anthony Saunders� atmospheric painting Return of the Pathfinders depicts the Pathfinder Mosquitos of 139 (Jamaica) Squadron, a unit that had joined Bomber Command�s No 8 (Pathfinder) Group in July 1943. Anthony skillfully conjures up the mood as dawn breaks over a crisp, icy landscape in a burst of color that illuminates the Mosquitos as they follow the course of the River Great Ouse on their return to RAF Upwood after a long overnight trip to Germany in early 1944. During a period that began on the night of 20 / 21st February 1944 this particular squadron undertook a series of 36 consecutive night attacks on Berlin. Adding great authenticity to this superb release, every print has been personally signed by highly respected veterans who flew de Havilland Mosquitos in combat during WWII, including members of the Pathfinder Force, creating a historic collector�s edition.